Cyprus Department of Antiquities, Ministry of Communications and Works, announces the conclusion of the 6th season of excavations in the framework of the Agios Sozomenos Excavations and Survey Project (ASESP) at the localities Ampelia and Nikolides, under the direction of the Curator of Antiquities Dr. Despina Pilides. This excavation season lasted from 10 September until 26 October 2018. This year our aim was to further investigate the pithos storage house on the small hillock at Ampelia, its extent and chronology as well as investigate the plan, chronology and nature of the monumental fortification at Nikolides. Excavation continued on the east side of the building found last year, to establish whether it extended down the slope of the hillock. The cobbled courtyard, part of which was unearthed last year did indeed extend further, possibly enclosed within a very disturbed wall on the east side. The cobbled floor extended further to the south. 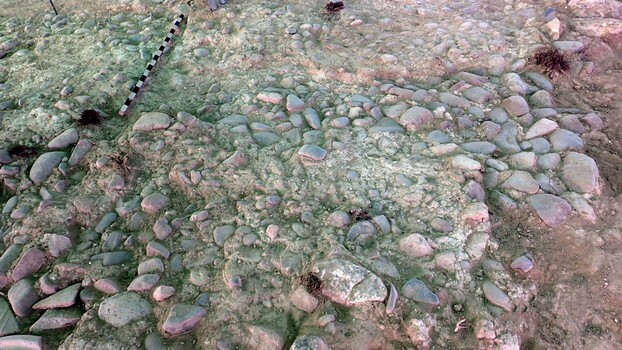 It seems that this floor was renewed, as in some places where this was not preserved, another quite well preserved cobbled floor was found below, with strewn pithos sherds on it, some decorated with wavy lines left in situ. The pebbles of the earlier floor were set in a layer of plaster, which was then covered with another layer of plaster in which the pebbles of the new floor were set. In some places a thin layer of yellowish brown soil was found below the later floor. The extent of the floor on the south part was lost as a result of recent cultivation activities. The same activities caused the destruction of the architecture on the east side, although it seems that the building extended on this side as well. The north wall of Room 1 (the Pithos room) was not preserved and excavation on the north side, down the slope again proved fruitless. On the west side, traces of a floor were discovered as well as a layer of ashes, possibly from the fire destruction noted last year, as well as strewn burnt stones, possibly remains of a wall. Only pithos and storage jar sherds were retrieved. Some crevices in the bedrock seem to continue the ones noted last year. The same layer of ashes and remains of a burnt floor of plaster were noted on the SW part of the building. 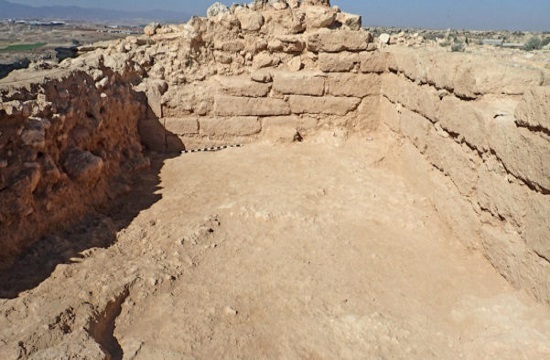 A broken pithos was found fallen on top of a stone basin, sunk in the floor. Inside the basin, of roughly oval shape, there were small sherds of a White Slip I bowl with a perforation, sherds from a Base Ring juglet, fragments of a Plain Ware plate and Black Slip sherds. A large storage jar with a wide fairly tall neck and a horizontal incised band on the shoulder and horizontal handles was found as well as a thumb-grip handle, most probably from another pithos. A soft fill inside the basin contained a cylindrical perforated stone weight, a triangular stone weight, a clay weight with a central perforation and a flat grinder of diabase. The bottom layer inside the basin was darker in colour and was sampled in the hope that it may provide evidence for the activities conducted. On one side of the basin facing north, there was a perforation but if it was a drain hole, there was no outlet as it was sunk in the bedrock. A layer of packed mud around the basin was removed to reveal stones in situ that may have held the basin in place, on the south side these were placed upright. A burnt White Slip bowl, some cooking ware sherds, Plain Ware and Red slip sherds were collected in this area. At a short distance to the south another small circular pit was found, possibly for holding another storage jar in place. Further excavation on the west side unveiled a fragment of a possible wall but nothing else was preserved. A large saddle quern of diabase, a gaming stone with depressions, a pounder and large quantities of pithos sherds indicate agrarian activities. The house must have been consisting of at least three adjacent rooms, next to the storage room and a large courtyard to the south. The large building stones, some of them worked, which were redeposited to the east of the tower and hindered our work, were removed by mechanical means and retained, so as to be utilized for the study of the volume of the stone material used for the construction of the fortifications. The aim was to establish the way that the circuit wall joined the tower. Below this debris, a soft sandy fill was removed to reveal the plaster floor below, made directly on bedrock. The plaster floor was only partly preserved and, at parts, it seems to have been laid on top of a pebbly reddish substratum. No finds were recovered except for a few sherds of Black Slip or Red Slip. A cavity in the bedrock was excavated close to the circuit wall, which seems to have been made at a stage, however, because it cut through the floor of the entrance between the tower and the circuit wall, as supported by some Plain White sherds from an amphora found inside. The circuit wall was reveled for some distance, running parallel to the ashlar wall of the tower. The outer face of the circuit wall was also dressed with rectangular ashlar stones, perhaps to be in uniformity with the tower. The tower was built on top of the bedrock, which was used as a foundation; in the cases where it was uneven, small stones were used to level it to a straight line and the ashlar stones were placed on top. Only small sherds of Red Polished ware, some cooking pot sherds and the flat base of a miniature juglet were found. Excavation continued on the line of the circuit wall, to trace its outline and see how it joined with the tower. Huge destruction was caused by bulldozing as the cavities in the stone rubble have shown, that required laborious removal of the shifted ashlars and stones of about 0.5 m. depth until a staircase of large ashlars (1.20mx0.45m) was revealed leading from the interior of the fort onto the tower. Smaller sized ashlars were placed on either side to form a floor surface. A large worked stone with projections was found, possibly at the point of the entrance from the circuit wall into the area in front of the tower, and in the adjacent trench there were two postholes, possibly for the support of a doorway; further work is, nevertheless, necessary in order to clarify the construction at this point. 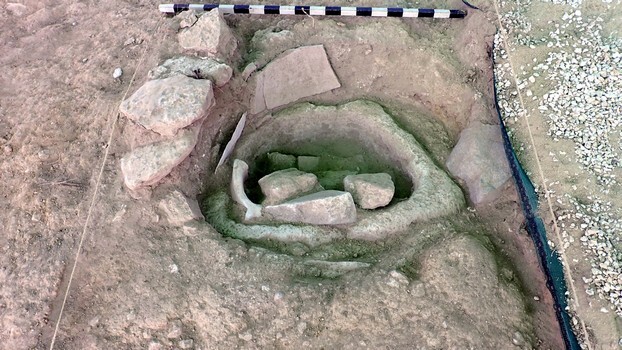 As already noted last season, very little cultural material was retrieved consisting of small quantities of ceramics and no objects, a fact that needs to be taken into consideration in the interpretation of the evidence, as it is also a characteristic of the settlement (Tzirpoulos and Ampelia). Even though excavation is slow and laborious, it is now evident that we have a monumental fort, erected initially, towards the end of the Middle Bronze Age, with an addition of a formidable tower of fine construction, possibly in the early part of the Late Bronze Age; it is a fort of strategic importance overseeing the entire valley in all directions and a construction that could not have been built without organized labour and substantial control of resources.